This Lemon Cheesecake with Blueberry Compote is ridiculously creamy & bursting with fresh spring flavors. A few weeks ago I was gifted with a pie. An ENTIRE apple pie to be exact. With delicious cinnamon apple filling and a flaky, buttery crust. And since I am a terrible pie maker – this was quite possibly the best culinary gift I could be bestowed with. Clearly I had to make something amazing in return. Something equally delicious that could live up to that perfect pie. And this Lemon Cheesecake with Blueberry Compote does just that. A delicious, buttery graham cracker base with a slight crunch; ridiculously smooth cheesecake with that perfect cheesecake tang and fresh lemon flavor; then topped with sweet, juicy blueberry compote. The tarteness of the lemon and creamy tang of the cream cheese are the ultimate pairing. Then the blueberry compote takes it to a whole other level. 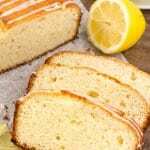 The lemon flavor comes from using lemon zest and fresh lemon juice from 2 whole lemons. No substitutes here – just fresh, tangy, sunshine-y lemons. In total, you’ll end up with about 2 tablespoons of zest, 4-6 tablespoons of juice, and quite a pronounced lemon flavor. If you’d like a more subtle hint of lemon just use one lemon instead. Now making cheesecake is quite straight forward. But if you haven’t experimented with making such a tasty dessert – why don’t we run through some of the key tips. Have all your ingredients at room temperature before getting started. This helps everything mix together easily. Really beat the cream cheese – the last thing you want is lumps in your cheesecake. Add in the eggs at the very end, and stop beating the batter as soon as they’re incorporated. When beating the eggs it adds air to your mixture. More air = more chance of your cheesecake cracking. On that note – we’re going to use the water bath method to bake our cheesecake. This keeps moisture in, reduces the chance of cracking and ensure our cheesecake is deliciously smooth. Then finally be very careful not to open the open door while baking. This can cause swings in temperature that cause your cheesecake to sink then crack. 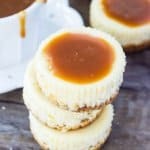 After the cheesecake is done baking, allow it to cool fully to room temperature then cover tightly and refrigerate for at least 4 hours or preferably over. With cheesecake the flavors come into their own over time – so refrigerating before digging in is so necessary. Then for the blueberry compote we’re simply boiling up some blueberries along with a little water, sugar and lemon zest until the berries soften and the mixture thickens. The cheesecake is completely delicious on its own – but the blueberry topping takes it to a whole new level. 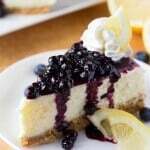 Lemon Cheesecake with Blueberry Sauce. 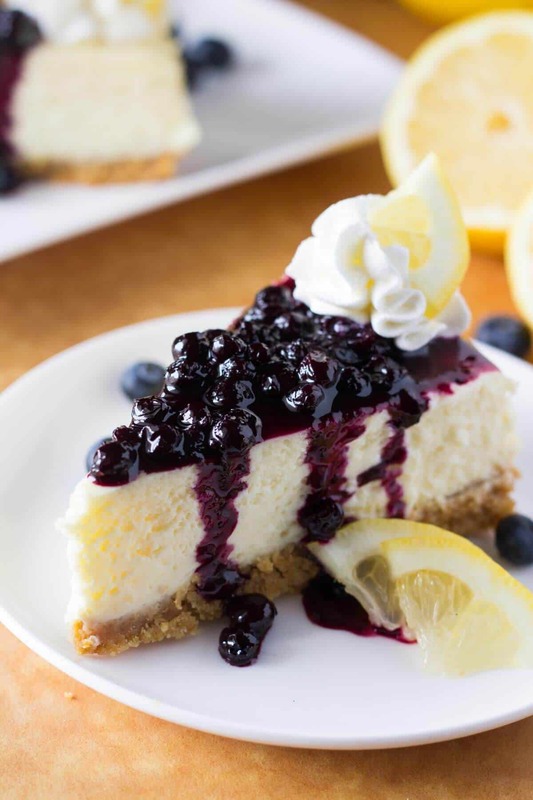 Creamy cheesecake, perfectly tangy lemon & juicy blueberry sauce - the PERFECT cheesecake flavor combo! Preheat the oven to 350F degrees. Wrap a 9 inch springform pan with aluminium foil so that you can fold the aluminium foil over the edges. Wrap at least 3 times so that every part of the outside of the pan is tightly covered. Spray the bottom of the the springform pan very lightly with non-stick cooking spray or grease very lightly with butter. Set aside. To make the crust, in a medium sized bowl mix together the melted butter, sugar and graham cracker crumbs. Press the mixture tightly into the bottom of your springform pan. Bake in the preheated oven for 8 minutes. In a large bowl using a hand held or electric mixer beat the cream cheese on medium speed until very smooth and no lumps remain. Add in the sugar and lemon zest and continue mixing until fluffy. Turn off the mixer and scrape down the sides of the bowl with a large wooden spoon or rubber spatula. Gently fold in the lemon juice and sour cream. With the mixer on low add in one egg at a time until combined. Place the springform pan into the center of the roasting pan. Pour boiling water into the roasting pan so that there's about 1/2 to 1 inch of water. Then pour your cheesecake batter into the springform pan. Very carefully place the roasting pan with the springform inside of it into the oven. Bake for 50-65 minutes until the there's about 2-3 inches in the centre of the cheesecake that still has a slight wobble. Remove from the oven and allow the cheesecake to cool in the roasting pan. Using a very thin knife, gently trace around the outsides of the cake. Once the water is lukewarm to room temperature, remove the springform pan from the roasting pan, peel back the layers of aluminium foil and continue cooling til the cheesecake is room temperature. Then wrap tightly in cling wrap and place in the fridge for 4+ hours or preferable overnight. To make the blueberry compote place all the ingredients in a medium saucepan over medium heat. Allow the mixture to simmer and the blueberries to soften as you stir the pan occasionally so that the mixture doesn't burn. Cook for about 15-20 minutes until the juice begins to thicken. Once ready to serve, remove the cheesecake from the fridge. Trace around the edges of the cheesecake again using a very thin knife. Then undo the clamp of the springform pan and remove the sides of the springform. 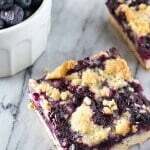 Top each slice with blueberry compote and optional whipped cream. Looks wonderful! I will make it for our choir party on June 12th! The instructions are carefully details that one will surely create beautiful yummy Blueberry Cheesecake. Can I use fresh blueberries instead? Yup! That would definitely be fine! I usually make the blueberry sauce in advanced but put it in the fridge in a container. Then when serving each person can pour on as much as they like themselves. Consider just using Marie biscuits and don’t add the sugar. I’m making this for my mom’s birthday. But I find cream cheese mixture quite runny. I hope it thickens up while baking, I’m a bit nervous. Everything was at room temperature so I’m hoping that’s why? Does that sound right? Absolutely love this recipe it came out amazing! the lemon and blueberry the flavors they complement each other very well. it was very easy to make and follow. Is it better to use frozen blueberries? I live in Florida and am fortunate to have fresh blueberries available. Can you explain wrapping the pan with foil better? You want to wrap the outside of the pan so that the bottom and sides are fully covered. I’ll take a piece underneath the pan then fold it up the edges, and over the top. Then repeat the process 3-4 times so that all the sides are totally covered. I actually made a video showing exactly how I make the waterbath and wrap the pan on this post here: https://www.justsotasty.com/new-york-cheesecake/ I hope this helps!